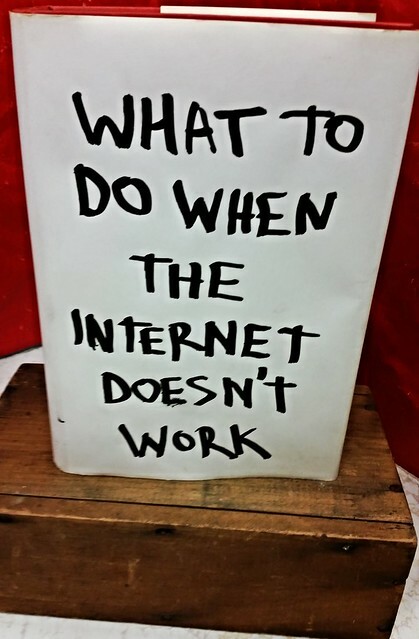 A book with a white cover, saying "What to Do When the Internet Doesn't Work" at Salem Arts Association. I happened to pop into the Salem Arts Association on Essex Street in Salem, MA and if you get the chance, you should too. It's filled with an odd mixture of art. Some of it is intriguing, some of it is silly, some of it is kitchy. But it's free to wander about and they have some great ironic pieces like this book. That's what I like particularly about this display of works is that many of them are created from the mundane and yet twisted in some way into curious displays of art or displays that make you think differently.